A PARAPHRASE OF CHILDHOOD. The little wooden figure from childhood, which only stays upright with the help of internal strings, is here transcribed to a form where the life-like ripple is replaced by stoic stillness. While the movements of the toy depend on our actions, the qualities of the xus chair can best be seen without us. The space of the naked chair for the essence of the naked space. Ex-us, in a manner of speaking. Time has turned the impossible into possible. Xus is now moulded in just one piece, entirely three dimensional. 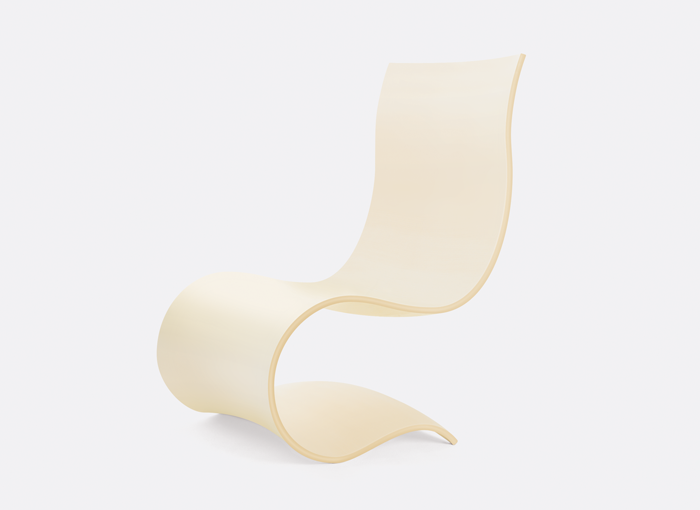 Lounge chair in laminated beech. Moulded in one piece. Prototype. Not in production.